Give friends, family and business partners a gift voucher for an enjoyable evening that they will remember. You can order your gift voucher quickly and easily here. You will receive a high quality printed gift voucher by post (postage costs: 1.45 Euro), which then, can be posted directly to you, Alternatively, you can visit us and pick up your gift voucher in the Hardthaus without further costs. 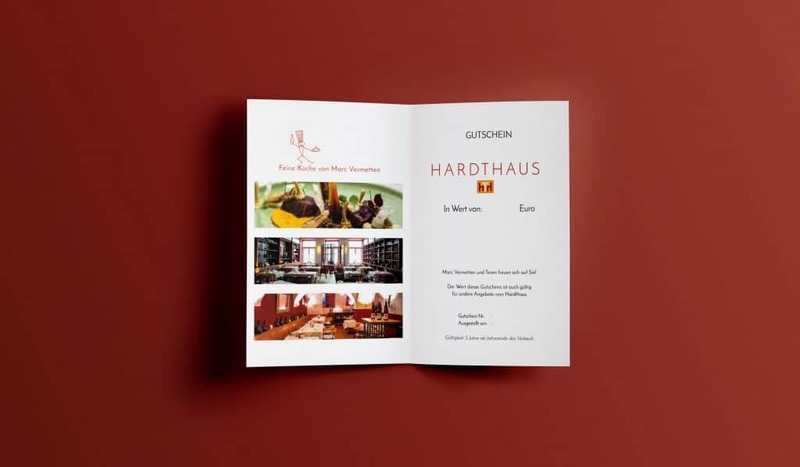 The Hardthaus gift voucher is comes in a folding brochure design with photographs and information as pictured above. If you choose to pay by bank transfer, we will send you the gift voucher and the invoice. Please pay the total amount (gift voucher + shipping costs of 1.45 Euro). As soon as we have registered your payment, your voucher will be created and sent. If you choose to pay for the gift voucher at pickup, everything will be prepared and will be stored in the restaurant in your name. Gift vouchers can only be collected after 10 am. To ensure that your gift voucher is ready please call before you visit. You will receive your gift voucher by post (shipping costs 1.45 Euro). Please select your preferred type of payment for your order. The minimum order value for a voucher is 20 euros. Please enter your personal contact details such as name, e-mail and telephone number. Please note that your data will only be stored internally. Any transfer of information to third parties is prohibited.